Japanese economic policymakers are now trying to guide through social media influence. President Trump is trying to tighten Japanese monetary policy. The Fed has tightened Japanese monetary policy. The BOJ probably lost its independence way back when it first embarked on unconventional monetary policy easing. Japan is preparing to consolidate the banks in order to address the economic cost of further QQE with bank balance sheet scale. In Japan there is only one real buyer of JGBs at these levels… the BOJ. Perhaps in order to hide the fact that the BOJ is monetising its deficit, policymakers have created a social media influencing cyber-pet to convince the population that everyone is a willing buyer. 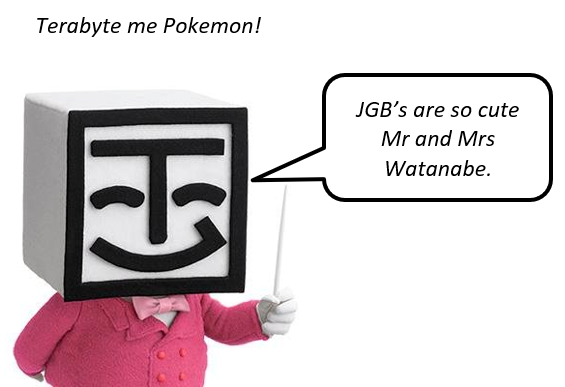 Kokusai-sensei boldly hopes to promote the myth that there are many willing Japanese buyers of JGB’s. 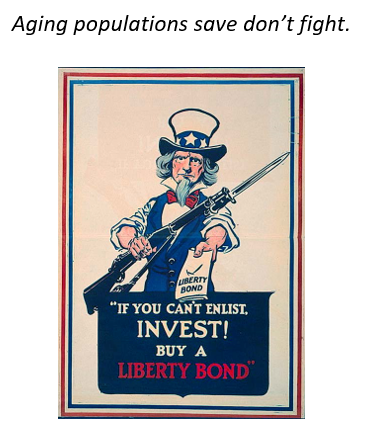 It is all reminiscent of America’s Liberty Bond promotions, except in reverse. Japanese savers are the liberators of their debt enslaved masters. This time around, as history rhymes, Japan is fighting a trade war. Japanese citizens are allegedly financing this war. In truth, however, it is the BOJ that is providing the monetary fire-power since the citizens are too old to sustain the heavy lifting for the rest of their mortal lives. The use of social media for monetary policy guidance, once again shows that Japan is ahead of the game in the global economic world of the New Normal. Japan’s critical policy problem, the appearance of the loss of credible commitment to achieve sustained economic growth and inflation, is entering the brave new world of social media influencing guidance. President Trump has already made good use of this medium. Evidently, the Japanese have learned and developed their own spin. If and when the next phase of monetary debasement by central banks embraces crypto-currencies, the Japanese will have an influencing tool and hence the ability to frame the debate. Global central banks are currently adjusting their monetary policy frameworks to the new environment of Lowflation and managed/protected global trade. Fed Chairman Powell has kicked off the global process with a monetary policy framework review. This has since been followed by the ECB’s President in waiting Ollie “Rehnfeld”. Such reviews will ultimately lead to further and larger monetary policy stimulus. Always appearing last but not least comes the BOJ. Japan knows its monetary policy scripture and therefore understands that he who is last shall actually be first. Thus as it politely awaits its turn at the currency debasement altar, the BOJ has been preparing for this moment for some time. Having left his indelible mark on the Fed, President Trump is about to leave his mark on BOJ monetary policy. America would like to insert a clause about currency manipulation in any upcoming trade deal with Japan. The Japanese really don’t want to do this. Any such cause would be a de facto guarantee of the American ability to tighten of Japanese monetary policy. In recent months the BOJ has made noises about easing again if the Yen strengthens. These noises would effectively be muffled, as would any unilateral action by the BOJ, if the Yen got stronger as this currency clause was inserted. In the absence of the currency weapon, the BOJ would then have to wait for the stronger Yen to impact the domestic data before embarking on further monetary policy expansion. The recent decisions taken by the Fed, to put interest rate hikes on hold and end balance sheet run-off, have also initially tightened Japanese monetary policy by weakening the US Dollar versus the Yen. Politically from Trump and economically, from both Trump and the Fed, Japanese monetary conditions are tightening via the exchange rate. A chorus of voices, from the Japanese banking sector, has been rising to make the case for raising interest rates heard above the noises being made for further easing. This has culminated in Koji Fujiwara, chief executive of Mizuho Bank and chair of the Japanese Bankers Association, recently calling for higher interest rates and the inflation target to be dropped altogether. From his perspective, it is more important to have a stable functioning private capital formation sector in the form of the banks. This stability can only come, in his opinion, through higher positive interest rates. In order to get there, he believes that the inflation target must be abandoned therefore. The banking sector is hence a significant and growing obstacle to the BOJ’s long-term easing plans. This obstacle must be addressed and coerced as a precursor to any future monetary policy easing. BOJ Monetary Policy Board member Yutaka Harada has started to make the noises in anticipation of future monetary policy expansion. First he listed a litany of benefits attributable to QQE, even a reduced suicide rate. He then listed the growing number of global risks that mitigate in favour of more QQE. Finally, he addressed the issue of the negative impact of QQE on the banks. Harada frames this negative impact as a surplus of deposits unbalanced by a rise in loan demand. The inference is that raising interest rates would make imbalance situation worse. As the remedy he argues that the banks should pass on negative interest rates to depositors, thereby forcing them to spend rather than save. This however ignores the fact that a run on banks, to avoid negative interest rates, may in fact trigger currency hoarding and a depression. His analysis, of the problems facing the banking sector therefore, does not stand up to close scrutiny. Whilst noting that recession is not his baseline scenario, Harada opined that the BOJ would have to step in swiftly if a future slowdown threatened its ability to hit the inflation target. He is more cognizant of the recent failings of QQE in this regard, although less so of the negative externalities impact on the banking sector. In recognition of these challenges, Harada called for future monetary policy easing to be part of a coordinated economic plan with elected policymakers. This suggests that he is aware that the BOJ has lost its independence. A cynic would argue that, since the BOJ owns the lion’s share of capital market assets on its balance sheet already, the central bank requires a fiscal expansion to give it the government debts to monetise. The BOJ is thus de facto and de jure a fiscal arm of the government. Japan is about to prepare its banking system to deal with any future monetary policy easing, that may put further pressure on lending margins and business models. The government has signalled that it will roll back anti-monopoly rules that have frustrated domestic banking consolidation. The cost of future monetary policy easing will thus get passed on to bank customers of larger consolidated entities. The ultimate hit to the consumer will be a further consumption headwind, so this will all come back to haunt the economy in the future. Japan is at rock bottom and has started digging deeper again. This time it will be digging with larger banks and even larger amounts of QQE. The resultant economic hole created will be much bigger; and will arrive even faster than the current one. Further lobbying pressure on the BOJ to start normalising monetary policy is now coming from industry. The Chamber of Commerce and Industry chairman and spokesman Akio Mimura believes that the BOJ has defeated any sharp appreciation in the Yen with its lengthy QQE process. Consequently, the BOJ should focus on preparing to end QQE and start normalising when the global situation allows it to. It’s a seductive argument based upon some imaginative reasoning. It is also totally subjective. Unfortunately, the subjective view of the government and the BOJ that it controls is much more important. The Chamber of Commerce and Industry has also been joined by the regional banking lobby. Takashige Shibato, head of the Regional Banks Association of Japan, recently called out the BOJ on its failure to hit the inflation target, after six years of easing, when initially promising to do it in two. Mr Shibato believes that going forward the BOJ should be more mindful of the negative impacts on the banking sector from its policies. His voice was then joined by that of former Kuroda colleague Isao Kubota, chairman of Nishi-Nippon City Bank. Kubota does not see regional bank mergers as the panacea that will allow the sector to survive continued/increased ZIRP/NIRP with scale. This push-back can be viewed as a confirming signal that indeed the move, to scale up the banks to deal with further QQE, is a policy move under current construction. On the eve of the latest BOJ Monetary Policy Board meeting, Finance Minister Taro Aso appeared to take the pressure off the BOJ to ease further. Addressing parliament, Aso was conciliatory in suggesting that there would be no shame in the BOJ adopting other measures of inflation. In his view, the BOJ has succeeded in stimulating inflation by many such alternative measures even though it has not reached its official target. As he sees it, the official target is so ambitious as to make it meaningless. BOJ Deputy Governor Masayoshi Amamiya avoided Aso’s trap, which apparently leads to monetary policy normalisation. Responding with alacrity to Aso’s praise, he countered that achieving the inflation target should remain the BOJ’s main priority. Clearly, Amamiya is worried that abandoning/changing the inflation target creates a greater loss, of credible commitment for the BOJ, than its current to failure to achieve it. It is rumored that there are some in the BOJ’s Monetary Policy Board, who see the inflation target as being elusive for the next three years. Amamiya must be one of this some. It transpires that Aso’s view may not be shared by all of the government. Chief Cabinet Secretary Yoshihide Suga opined that he expects the BOJ to continue all efforts to hit its inflation target. The Cabinet Office’s own coincident index of business conditions for January was down 2.7 points month-on-month at 97.9 against the 2015 base of 100. It was the index’s third consecutive decline, creating a trend that prompted the office to say that it was “signalling a possible turning point.” Prior to that, the office had classified conditions as “weakening.” The BOJ is falling behind again. Faced with its critics and alleged supporters the BOJ Monetary Policy Board decided to maintain its alleged independence, from any other influence than the data, at its latest meeting. Policy was left unchanged. He expects the Chinese and European economies to recover in H2/2019. To additionally address the critics from the banking sector, the support of their regulator has been enlisted by the BOJ. Together both regulators will conduct stress tests on the regional banks in the near future. Said tests have been framed as designed to prompt the banks into changing their business models to encourage them to lend. Clearly, the banks won’t be getting any support from rising interest rates for the foreseeable future. In fact, they may be being prepared to endure a lengthier period of ZIRP/NIRP and/or even more QQE. One should expect the regional banks to fight a counter-offensive. The BOJ doesn’t expect to act in either a normalising or easing manner anytime this year. The central bank has however constructed the basis for a flexible response to conditions that are unexpected. What Governor Kuroda left out, was what Mr Market wanted to hear. What happens if these expectations are wrong and the Yen appreciates? Regional land prices outside the main cities of Tokyo, Osaka and Nagoya rose year-on-year for the first time since 1992. If this is an indication that Japan is now seeing light at the end of the tunnel, in its multi-decade attempt to reflate its economy, this creates an interesting dilemma for the BOJ. The pressure to be more aggressive with monetary policy easing has clearly been reduced. The new pressure, to ease further or at least not to normalise, will come from how to sustain the fledgling reflation. The Government’s Cabinet Office has now downgraded its economic forecast in response to the global trade tensions. This downgrade however still sees lower incremental growth, so as yet it is not a call for future fiscal and/or monetary policy stimulus. Minutes of the latest Monetary Policy Board meeting show an alarming lack of consensus. Opinion ranged from those seeking a greater emphasis on the preparedness to ease again, through those worried about the banking sector, to those worried about the bubble risk in asset prices from easing again. This lack of consensus will take time and conclusive data to build into something that the BOJ can project in the form of guidance and policy action. There is no alternative to being “patient” for the BOJ right now. Symbolically and perhaps more importantly, Prime Minister Abe has now taken away the political pressure to ease further in the short-term off the BOJ. Facing the fact that the global headwinds are insurmountable by monetary policy, Abe now views the inflation target as a means to the end of growth rather than something to be taken literally. He therefore still expects the BOJ to adhere to current policy, so that a normalisation is off the table. A dramatic attempt to ease again is however not required from him at this point in time. This apparent removal of pressure on the BOJ appears to be part of a carefully laid trap. Senior Abe adviser Kozo Yamamoto has almost given the game away. In a loaded interview, he lamented that he could not get the PM to agree not to raise sales taxes. The sales tax increase and its headwind are now inevitable. Yamamoto also said that the BOJ is not at fault for missing its inflation target. His explanation, of where the blame lies, revealed the carefully laid trap mechanism. He lays the blame squarely at the monetary policy framework previously adopted by the BOJ. This policy framework uses interest rates rather than asset purchases to set monetary policy. The BOJ is not to blame, but it is actually to blame because of its monetary policy framework! Just to finish the trap with finesse, Yamamoto then said that a massive fiscal stimulus is now needed in the face of trade wars and a global recession. The image of the BOJ as fiscal arm of government was complete. Cue a BOJ monetary policy framework review (just like the Fed and latterly the ECB). Then cue a massive fiscal stimulus in proportion to the massive global headwinds. Then cue further massive QQE. The latest BOJ summary of opinions shows that the level of debate over a new round of easing has risen significantly. Maybe the BOJ isn’t walking into an easing trap after all. Maybe it is rushing and/or being driven towards it. At the end of the day, the BOJ understands that the Government is holding all the cards in terms of the inflation target. The formula that sets the inflation rate calculation is constituted from inputs that the Government controls the price of. Inflation is everywhere a political phenomenon in Japan already by default. The BOJ’s real job is to monetise the deficit. The system is rigged, to make sure that the BOJ has to keep doing this in order to achieve its inflation target. The BOJ is therefore happy that it is missing its inflation target. If it were to hit its target, the whole house of debt would come falling down because it couldn’t ease again. The BOJ is thus a willing arm of government.